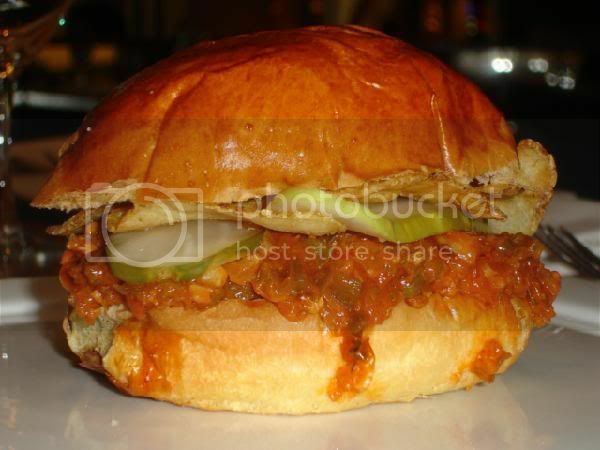 catfish sloppy Joe "These are just as sloppy and delicious as you could hope for. Soft, tender potato rolls are my choice for serving, but any hamburger bun will do," says Rick. Sloppy Joes are also great made with tilapia, but you could try skinless wild salmon, farmed char, and farmed trout, too. Ingredients: 1/2 pound catfish fillet, cut into 1/3-inch pieces. Coarse salt. 1/4 cup vegetable oil. 1 cup diced onion. 1 cup diced green bell pepper. 2 teaspoons paprika. Barbecue sauce for fish (recipe below). Butter, softened. 8 hamburger buns. Potato chips. Sliced pickles. Season the catfish with salt. Heat a saucepan over medium-high heat. When the pan is hot, add the oil, onion, and bell pepper. Saut&#233;, stirring often, until the onion starts to soften, about 3 minutes. Stir in the paprika and saut&#233;, stirring, for 1 minute. Add the catfish and saut&#233; for 1 minute. Stir in the barbecue sauce and bring to a simmer. Reduce the heat to low and simmer for 6 to 7 minutes, until thick. Meanwhile, heat a griddle or cast-iron skillet over medium-high heat. Butter the buns and toast them on the griddle. Fill the buns and pile some potato chips and sliced pickles on top for crunch. Serve these joes while they're hot. Fish deserves its own special barbecue sauce. 2 tablespoons vegetable oil. 1 cup minced onion. 2. Large garlic cloves, minced. 1 teaspoon thyme leaves. Coarse salt. 1 tablespoon sugar. 2 tablespoons water. 1 tablespoon red wine vinegar. 1/2 cup clam juice. 1 cup ketchup. 1 teaspoon Tabasco sauce. 1 teaspoon Worcestershire sauce. Freshly ground white pepper. Heat a saucepan over medium-high heat. When the pan is hot, add the oil, onion, garlic, and thyme and a pinch of salt and cook, stirring often, until the onion is softened but not browned, about 5 minutes. Meanwhile, combine the sugar and water in a small skillet over medium-high heat. Cook swirling the sugar in the skillet, until the caramel is dark amber. Add the vinegar and clam juice and boil until the caramel has dissolved. Add the caramel and clam juice to the onions, along with the ketchup, Tabasco, Worcestershire, and pepper to taste. Bring to a boil, then lower the heat and simmer the sauce for 20 minutes. You can make this well in advance. It will keep for days in the refrigerator. Last edited by CAPT'N; 05-08-2008 at 06:46 AM. to tell you the truth I agree with you, but that picture has me salivating. I am going to have to try it, maybe with Striper!